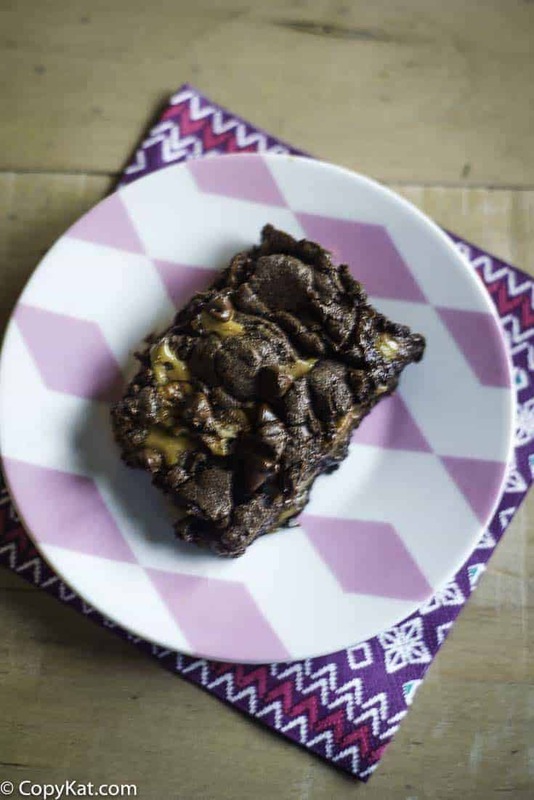 This turtle brownie recipe is perfect for those who love chocolate, caramel, and pecans. If you want an easy recipe to make turtle brownies with cake mix, this recipe is for you. 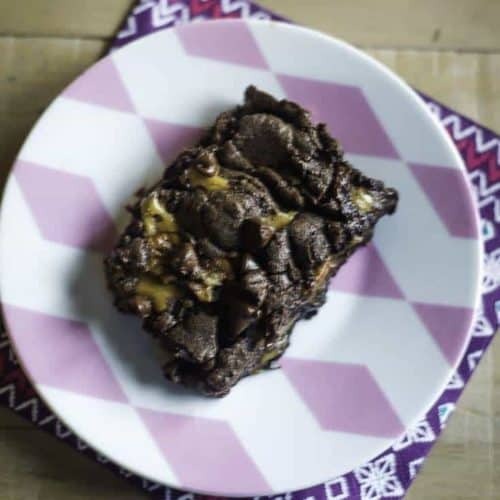 Everyone loves turtle brownies, these brownies are full of ooey gooey caramel, semisweet chocolate chips, and chopped pecans. To make this recipe super easy you are going to start with a box of cake mix. I love to use a dark chocolate cake mix because it will give you a full rich chocolate flavor. I have served these brownies for company that they thought these brownies look and they tasted amazing. Adding caramel to brownies combines the flavors that everyone seems to love, I mean who can turn down caramel and chocolate? Caramel brownies are a crowd pleaser, and for this recipe, you will need to purchase some wrapped caramels that you will find in the candy section of the grocery store. Caramel sauce will not harden like the wrapped caramels. Alice Medrich’s Cookies and Brownies is a great source for even more brownie recipes. These super moist and fudgy brownies are made of chocolate cake mix are full of rich gooey caramel, chocolate chips and fresh pecans. Melt caramels with 1/2 can of eagle brand milk. (I do this in the microwave). Mix melted butter, 1/2 can eagle brand, cake mix (dry) and 1/2 of the nuts together. Place 1/2 of brownie batter in a greased 9x13 pan and bake at 350 for 6 minutes in the preheated oven. Spread 1 cup of chocolate chips over top, then the rest of the nuts and the caramel mixture over the nuts. Press remaining batter between hands and place over the caramel. Sprinkle the remaining chocolate chips over the top and bake for 15 minutes more. 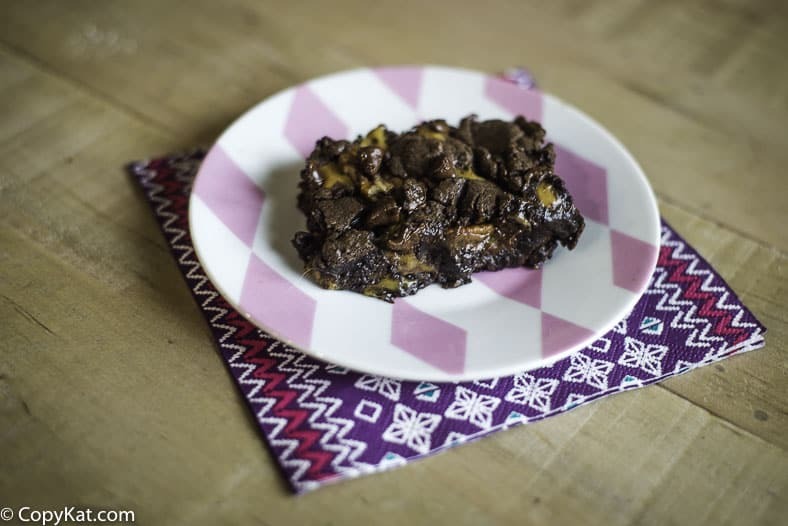 These turtle brownies were fun to make, quite easy peasy in fact, and delicious. They are nearly as rich as our family’s favorite turtle candies from the local candy shop. I think they would be totally yummy as a dessert served with vanilla ice cream on your loveliest of dessert dishes for a dinner party. Pop a pecan in the ice cream for an extra flourish, and you are straight on your way to caramely heaven! Thought you might be interested that Alice Medrich is going to publish an updated version of ‘Cookies and Brownies’ under the title ‘The Cookie Project’ in 2010. I’ll be posting all of the recipes from ‘Cookies and Brownies’ on my blog within a week or so, with her permission – and I’d love to have you visit and check it out if that’s a reference you use often! Thanks so much, and see you online!